Sitting in the basement of his temple—a makeshift cafeteria lit by soft fluorescent tubes and populated by plastic furniture—Thich Thien Chi struggles to explain the meaning of “Chieu Kien,” the temple’s name. After 38 years of practice as a Buddhist monk, half of them spent here in the Bronx, he doesn’t make a particularly forceful evangelist. Whether I believe in the message is an afterthought. In this nondescript building in the Tremont neighborhood, Buddhism is for lifelong learners, and no one is quick to boast of clarity when it comes to the principles of their practice—let alone push their worth on a visitor. When I ask the monk’s parishioners to spell out their own understanding of “Chieu Kien,” the conversation comes to a humble halt. Something about the phrase renders it immune to direct translation from Vietnamese, leaving a sheepish “I’m not sure how to say” or “let me think about it” in place of any immediate explanation. “It’s more like a thirty-minute conversation,” jokes Thien Chi, who, at the age of 57, is a portrait of meekness. Short and lean, his frame balances graceful movements against haggard features. The monk’s head is shaved, insofar as it matches the light coat of stubble on his face. His eyebrows are worn thin, sharpening a gaze that seems perpetually fixed. His smile, shared often, reveals teeth that are cragged and short. The softness of his manner belies the charisma and doggedness that enables him to run the Chieu Kien Buddhist Center, a plainly colored, two-story building and private garden on a residential block of Clinton Street. 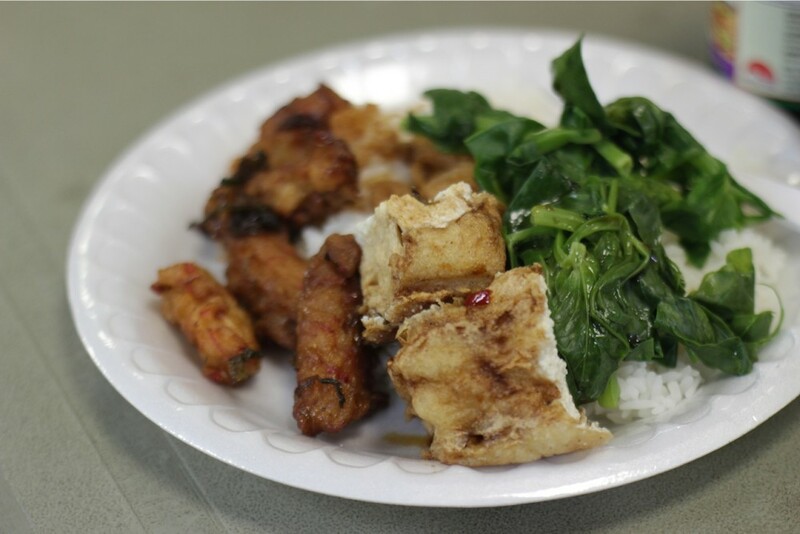 Since the temple’s founding in 2002, Thien Chi has renovated and revitalized the space, bringing over two hundred members to the Bronx for a weekly gathering where “service” encompasses both faith and food. Thien Chi steps aside to consult Anna Nguyen, a temple member who helps the monk prepare for Sunday’s meal. Putting down the knife she’s using to slice tofu, Anna laughs, and after some back-and-forth in Vietnamese, both Buddhists walk back to the table. Thien Chi, named Vo Phuong Thanh at birth, grew up in Long An, a low-lying province on the southern coast of Vietnam. Once a college student headed for the profession of law, he was forced out of school, his enrollment denied by the state when the war-torn country was reunified and the Socialist Republic of Vietnam began sending over two million of its citizens to “re-education” camps. A Buddhist from birth, he turned to the temple as an alternative, though the Socialist Republic would also take over the administration of Buddhism as a state-sanctioned religion. He became a monk, adopting the “holy name” Thich Thien Chi the year that Saigon fell to the Vietnamese People’s Army, and practiced under hostile conditions. Any options for Buddhist residency and official recognition as a monk were refused by the government as it continued relocation, urbanization and indoctrination programs throughout the south. Following hundreds of thousands of his countrymen, Thien Chi fled Vietnam by boat in 1989. The monk entered Indonesia’s Galang Refugee Camp just as the United Nations was closing it as part of its “Comprehensive Plan of Action” for Southeast Asia’s “boat people.” Along with thousands of others, he began the screening process for approval as a refugee, and was granted religious asylum in the United States after two years. In 1993, Thien Chi emigrated to New York and joined the Thap Phuong Temple, which still stands on Andrews Avenue in the Bronx, just across the Harlem River from Inwood. Nearly a decade later, he was approached by Thap Phuong members to discuss the founding of a new temple, where he could lead services and train a new generation of Vietnamese monks in New York. The temple-to-be was Chieu Kien, which Thien Chi built from the hollows of a former Catholic church in the thick of the Bronx. The walk through East Tremont to reach the temple offers no indication that one of New York’s most vibrant pockets of Buddhism awaits—unless one associates Buddhism with barber cloaks made from Puerto Rican flags. Salsa and merengue blare from apartment windows and cars as publicly as from the world music store, and the culinary gem of the neighborhood is El Nuevo Bohio, a Puerto Rican restaurant that specializes in juicy cuts of suckling pig. Economics aside, the unassuming location of the temple underscores its role as a magnet for a scattered people. “We’re spread out,” explains Long Nguyen, an engineer who helped raise funds to found the temple and acts as Chieu Kien’s secretary. “Some in Brooklyn, in Queens, Long Island, New Jersey…Here, temple is the only place we can all get together.” New York is home to about 13,000 Vietnamese-Americans. While over eighty percent of Vietnam is Buddhist, Chieu Kien and Thap Phuong are the only temples established specifically for Vietnamese Buddhists in the New York metropolitan area. A natural community center for three generations of Vietnamese immigrants, Chieu Kien is owned outright, its mortgage acquired with the help of local fundraising and paid off through sustained donation. The member count has hovered around two hundred for a decade, newcomers finding their way to the temple mostly by word-of-mouth. Members support its ongoing services with regular cash contributions. Chieu Kien springs into life every Sunday, but during the week the building is dormant, blending silently into its decidedly non-Buddhist surroundings. And while the temple is made whole by its members, Thien Chi remains its sole caretaker, living on site and leading the practice. Since his founding pupil and heir apparent moved to Vietnam with no sign of return, the monk has been living in solitude, sleeping in a cluttered bedroom not much wider than a hallway, and leaving the temple only to make house calls to sick or troubled followers. It was in solitude, with no spiritual or organizational successor in sight, that he began to cook in earnest. One of Buddhism’s basic tenets is abstention from killing. For some, the spirit of this abstention extends to diet, leading monks and nuns in particular to a lifetime of vegetarianism. Called đồ chay in Vietnam, Buddhist cooking is known by other names throughout East Asia; each culture reserves a space for the cuisine of karma, curated in myriad forms in temples and in restaurants. Every Saturday, Thien Chi spends hours preparing a meatless smörgåsbord for Sunday service. Drawing from his own kitchen experiments and from recipes shared by his followers, the monk and his volunteers typically feed over a hundred visitors. Most are familiar faces, friends and family who linger over styrofoam cups of tea and chat briskly in Vietnamese. While the congregation at Chieu Kien is overwhelmingly Vietnamese and Buddhist, the invitation to dine is an open one, the temple’s standing order for a good deed. Thien Chi, believing that one meatless meal counteracts the animal lives taken for a more carnivorous feast, cooks so much vegetarian fare on weekends that visitors are sent home with doggie bags for their families. Every takeout box of leftovers translates into more weight behind the monk’s promise to chip away at the world’s death toll. Whether those leftovers might be accompanied or replaced during the week by suckling pig is beside the point. In welcoming the faithful and the fanciful, Thien Chi and his members are more invested in making the food enjoyable by any standard. “You may work five days or six days or even seven days, so you only have a little time,” notes Thoai Lien, a chemist, tutor, poet and ardent fan of the monk’s recipes. “You spare those precious moments to come over here. That’s enough.” His words don’t capture just how worthwhile these moments can become for the ones who’ve shown up to eat. Some Buddhist cuisine is said to be bland by divine order, but the food at Chieu Kien—including a savory radish broth, sautéed vegetables and morsels of wheat gluten tastier than many a chicken dinner—tends to be full-flavored and satisfying, even for meat eaters. On Sundays, Thien Chi rises at four in the morning to cook. By the time his first visitors arrive, at around nine, several volunteers have taken over cooking duties in the temple’s narrow, tile-bound kitchen. Enormous rice cookers are plugged in wherever outlets can be found, and a wok nearly as big as a tire crackles with cooking oil. Food service begins promptly in the basement, lasting throughout the day, and Vietnamese language classes for the children commence on the second floor. By eleven, the corridor to the temple’s main chamber is littered with shoes. Thien Chi’s voice rings out from the temple sound system, transformed from meek to mighty as he delivers a ninety-minute sermon in Vietnamese on the spiritual significance of practical acts in daily life. Likewise, the drab, perfunctory grays and blues of the building give way to a burst of brightness when the chamber doors swing open. The room is packed with Buddhists sitting cross-legged on a bright red carpet, framed by white walls and leading to a mural of a Bodhi tree. A skylight just above the painting shines down onto a golden statue of the Buddha, seated at the base of the tree and reflecting light onto a yellow-robed Thien Chi, who is preaching the Mahayana Sutra into a microphone just a few feet away. After the sermon, the monk leads the entire room in meditation and in prayer. A small drum begins to beat, accompanying his rhythmic chants and quickening with the pace of his prayers. A deep bell sounds in intervals, each prolonged ring a cue for the group to bow. Once the prayer has concluded, Thien Chi leads a smaller group to an adjunct chamber, where a banquet’s worth of dishes is set out in honor of friends and family who have passed away over the years. He grasps a smaller bell and leads a second prayer for the deceased, whose photos line the walls. Fumes from a clean, sweet-smelling incense float through the rooms as thin sticks are lit, clasped in prayer, and shaken into censers. Members emerge from the crowd to speak with the monk, giving thanks and asking for advice. By the time he returns to the basement, the tables are still full, and the mood is warm. Drinking hot tea out of a beer stein, Thien Chi has a chance to relax. He trades jokes with everyone at the table, taking part in the communion he’s cultivated through years of peeling, chopping, stuffing, seasoning, boiling, steaming, simmering, frying and testing the tastes of his patrons. “You know why I cook?” he asks me, setting aside my handwritten interview questions with a grin. “When you do a job for your company, then you go home and cook and clean up for yourself.” The monk’s eyes perk up as he adds, “Me too!” In true Buddhist fashion, he’s included a body of two hundred as part of the self. When I ask him about the future of the temple, Thien Chi abruptly stops writing and does what some might consider shaking one’s head—a slow, solemn, tilt anchored by a blank expression. After pointing to the words, he presses the pen down again to write another, simpler answer: “Sad.” Then, as abruptly as he sank into the moment, the monk prods me and asks if I want to take his job. Giggling, he shuffles back to the kitchen to help move things on and on, his sights fixed on the wisdom of real things. All photos by the author. This article originally appeared on Narratively with additional photos and has been republished with permission. James Boo is a freelance journalist and the Editor-in-Chief of Real Cheap Eats, a locals’ guide to New York food for $10 or less. He is also a documentary filmmaker focused on the mythologies, realities, and legacies of ownership. ”I’m invested in how our lives fit into complex landscapes of belonging, possession, and loss. For nearly a decade, my work in non-fiction storytelling has examined how legacies are cultivated, performed, preserved, broken, and lost at the local level.